Fastrax, available through Glyn High-Tech Distribution , has introduced a new completely software based GPS receiver solution, with the aim of extending the use of location-based services in consumer electronics. Optimised in performance, footprint, cost efficiency and flexibility, the Fastrax Software GPS marks a new milestone in the development of pure software GPS technology. The software-based approach is expected to increase the speed of adoption of GPS functionalities beyond the highest end cell phones and laptop computers. Target platforms include mid-tier phones, digital cameras, personal navigation devices (PNDs), and other devices used while on the move. While traditional GPS solutions require the integration of a hardware component, making the design more complex and adding to the cost, a software based solution allows faster time-to-market with less costs and easily adjustable features. "The processor performance in consumer electronics devices is constantly improving, and more and more consumer products will be able to handle calculations required for GPS positioning," said Kim Kaisti, co-founder and VP of Business Development at Fastrax. "A software-based approach to GPS brings a number of direct benefits to original device manufacturers. As there is no longer a need for hardware integration beyond an RF front-end, bringing location-based features to any device with the adequate processing power will be faster, easier and less costly than ever before". Built on the foundation of Fastrax's embedded iSuite GPS software architecture originally designed for minimal power consumption in embedded environments, the new Fastrax Software GPS offers advanced performance even with limited processing power. The processor requirement for Fastrax Software GPS is roughly 10 MIPS (million instructions per second) per tracked satellite. In contrast, the software GPS solutions already introduced in the market are typically developed based on PC solutions, originally built without explicit need to optimise power drain or processor usage. According to Fastrax estimates, the software based approach to GPS will reduce the bill of materials to less than 3 USD per device, while still offering a similar level of GPS performance as hardware-based stand alone GPS receivers. With a cold start sensitivity of -144 dBm and a navigation sensitivity of -162 dBm, the Fastrax Software GPS solution is one of the best performing GPS solutions on the market and a new benchmark for GPS development. The limited requirements for processing power and memory usage make Fastrax Software GPS a feasible alternative even for less powerful processor platforms. In the development of Fastrax Software GPS, the emphasis has been in the optimisation of signal acquisition and correlation, the functions typically requiring the most CPU power and memory in software GPS solutions. 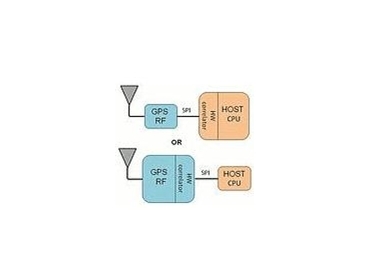 Fastrax's unique software GPS architecture enables the use of hardware accelerators on platforms that do not have the processing power to run a full software GPS solution. The Fastrax Accelerated Software GPS reduces the CPU load to roughly 1 MIPS per tracked satellite by performing the correlation process on hardware, either in the RF front-end chip or in the host processor. The Fastrax Accelerated Software GPS solution is targeted for devices using low-end or mid-end host processors. To ease the deployment in different kinds of devices, the Fastrax Software GPS and the Fastrax Accelerated Software GPS are configurable to obtain the best performance on every platform, depending on processing power and memory available. The desired trade-off between navigation performance and CPU usage can be flexibly set to suit the needs of individual devices and applications. Due to the high level of portability in the original iSuite design, porting the software to new operating systems and hardware platforms is quick and straightforward. The software has already been ported to x86 and ARM processors and Windows, Windows CE and Linux operating systems. The Fastrax Software GPS solution is currently available for demonstration purposes. In parallel to finalising the software GPS offerings into commercially available OEM products, Fastrax continues to further improve its range of programmable hardware-based GPS receivers.